I stock 12 and 16oz Ardagh brite cans in my warehouse. I also carry ends (lids), cardboard trays, and 4 and 6 pack PakTech in multiple colors. Everything is in stock and ready to ship. My lead time is days and can orders are accepted in 1 pallet minimums. Reach out to order! The Beer Cannon series of canning lines from Alpha Brewing Operations abound with innovation never seen on linear canning systems. Our design engineers sought after energy efficiency, simplicity and reliability while focusing on minimal dissolved oxygen pickup and maximum flexibility. The Beer Cannon checks all the boxes! Unique features and innovations include dual lane design, expandability (24 to 72cpm), servo motor technology, patent pending can weigh scale, revolver lid magazine, burst rinse/dry process and much more. Compare the Beer Cannon to others and you’ll see the robust build and careful craftsmanship. You’ll see the best value. You’ll see a weapon of mass distribution. We have a new web site – check it out: www.alphabrewops.com and request a quote. Cheers! Pack-off is the most labor-intensive aspect of canning. The “Mini-Gun” 4 – 6 pack carrier applicator offers instant return on investment! The Mini-Gun is the quietest, smallest, most efficient applicator in the industry. – Less than 1 full load amp (4 amps with conveyor).– Less than 2 cfm compressed air. Wait till you see the price! The Mini-Gun pairs perfectly with the Beer Cannon series of canning lines from Alpha or fit to any existing canning system. We have a new web site – check it out: www.alphabrewops.com and request a quote. We have over stock of 22 oz bottles in bulk. 4 skids available. 2142 bottles per skid. $500 per skid plus freight. All or part available. We also have white kraft cases and dividers for 22 oz bottles for $300 per skid if you need them as well (1 skid is 178.5 cases). Bottles and cardboard both located in Reno, Nevada. Email is best contact. Stoneyhead1@yahoo.com. Two pallets of 2,400 silver 32oz crowler cans in Manchester, CT. Originally paid $1,032 for each pallet plus shipping (over $2,500 total.) Asking $1,500 or best offer. Will also include a few sleeves of lids for free. Must come by and pick them up. 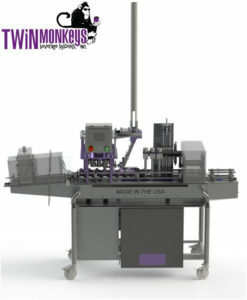 We have the Martin Robotics “8 Shooter” - 8 head bottle filler with labeler for sale. We purchased it in September of 2018 from a brewery that closed it’s doors. Extremely light usage and a great piece of equipment. We just don’t have the room for it at the moment. It’s already packaged up on skids and ready to ship. Asking $60,000. Price negotiable. Cost $120,000 new in 2016.